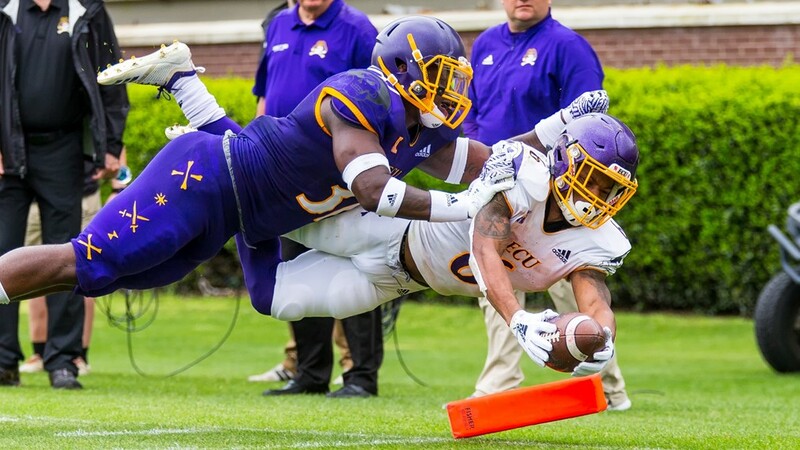 The ECU Pirates football team played the 36th Annual Purple-Gold spring game on Saturday, and fans came and watched even through a little bit of rain. The spring game wrapped up the first spring practice schedule for the Pirates under first-year head coach Mike Houston and staff. “You look at us today versus a month ago and there’s been tremendous improvement,” Houston said. It was an offense versus defense spring game. The gold team was the offense, who actually was wearing white, while the defense wore the purple uniforms. ECU used an interesting, non-traditional scoring system. The offense got one point for a first down, crossing the 50-yard line, a run of 15 or more yards, a pass of 25 or more yards, and extra points. They received two points for a 2-point conversion and got three points for field goals and six points for touchdowns. The defense got one point each for forced punts, tackles for loss and pass breakups. They got two points for three-and-outs, forcing missed field goals, fourth down stops, sacks, 2-point conversion stops. They got four points for a takeaway, either an interception or a forced fumble and blocked kicks. The only traditional scores were Hussein Howe, Darius Pinnix and Bryan Gagg rushing touchdowns, and a Reid Herring passing touchdown. The Pirates also got 40 and 49-yard field goal makes from Jake Verity. The defense was led by Aaron Ramseur with nine tackles, and Xavier Smith and Chandon Hickerson had six each. Still, the offense (white) came away with a 71-36 win. There wasn’t a lot of big plays. Probably the biggest of the day was a 48-yard pass from Ahlers to receiver Blake Proehl, which then set up an 18-yard touchdown run by Hussein Howe. Freshman quarterback Bryan Gagg had a nice moment in the second quarter, leading an effective drive that ended in an 18-yard touchdown run for the freshman. “That was another great example of a young guy who is supposed to be going to the prom or something like that, but he is out there in a college setting going against 19, 20 and 21-year-olds,” Houston said. Pinnix received a penalty after his TD run for throwing the ball into the stands in an attempt to get the fans fired up and involved (he clarified he wouldn’t ever do so in a regular season game). But perhaps more important than his TD score was a play earlier in the drive, when Pinnix converted on a fourth-and-2 situation. Pinnix ran through several defenders for an 8-yard gain to get the first down. Teammate and quarterback Holton Ahlers saw it as a very significant play. “Last year I don’t think we would’ve made that fourth-and-short there at the end of the game. I don’t think we would’ve called that play. It’s fourth-and-short and we’re trying to put the ball in the end zone. To call a run play and get seven yards out of it is a big deal,” Ahlers said. It was a question going in as to how much the game would be affected due to potential bad weather. It started raining briefly late in the first half that caused a few people to leave early but other than that, the spring game and festivities weren’t interrupted much. “The football gods love us, so they let us get it in. I was really glad, and to have the crowd that we had, expecting the weather and obviously that probably kept some people away, but we obviously have a lot of loyal fans that showed up anyway. I was really glad we were able to get it in for them,” Houston said. Houston said ECU will look to still add more pieces to bolster the roster and will look at making a depth chart before preseason camp in the fall. Some players will be cut after the period where the roster is evaluated and some grad transfers might be added to the roster to plug in some of the many holes the roster has. ECU fans will be anxiously waiting for that fall preseason camp to come and go and bring the Aug. 31 season opener against N.C. State with it. Daniel Charles, Myles Berry, Delvontae Harris, D’Angelo McKinnie: four tackles a piece. ECU’s new tower, part of the Southside Renovation project on Dowdy-Ficklen Stadium that is set to be complete this summer, was given the name TowneBank Tower. ECU AD Jon Gilbert, Pirate Club Exec Philip Wood made the announcement after a spring football practice last week. TowneBank, which recently opened a Greenville location, gave ECU Athletics $3 million for the naming rights. It certainly is a good sign to see the Greenville community draw up some excitement and involvement with the ECU Athletics department after four losing seasons in a row on the football field.